American Community School of Abu Dhabi students, Emma Hamre and Margret Emborsky, recently had the opportunity to visit NYU Abu Dhabi’s campus to interview two cultural ambassadors who had themselves just met, as part of a program for UAE/USA cultural exchange. 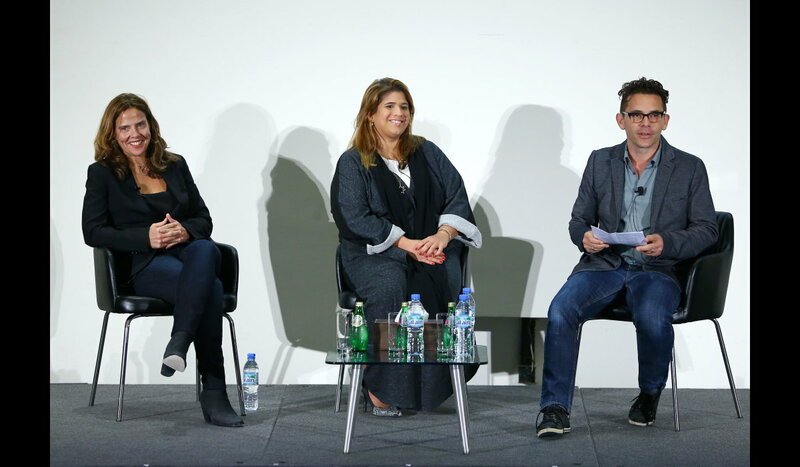 Here they reflect on meeting the American singer-songwriter Mary McBride, who performed at NYUAD on February 12, and the Emirati artist and curator Noor Al Suwaidi, who engaged McBride in conversation at the NYUAD Institute the same evening. Mary McBride, an American singer-songwriter, and her band, including Greg Beshers, Mark Stepro, John Kengla, and Jon Spurney, travelled to Abu Dhabi last Wednesday to perform multiple concerts at the Ability Center, NYUAD, and in Liwa. The United Arab Emirates is one of over 20 countries Mary and her band have visited in the past three years. They have released a total of four albums including “Everything Seemed Right” and “The Way Home.” Singing in an Academy Award–winning film Brokeback Mountain, performing with Elton John, and playing thousands of live shows hasn’t stalled Mary’s desire to bring music to those who need it most. In 2010, Mary founded the Home Tour, enriching lives through music and hoping to inspire and connect communities around the world by bringing music to people where they live. Common venues during the tour include long-term health care centers, homeless centers, orphanages, prisons, supported housing communities, homes for people living with HIV/AIDS, homes for veterans, and homes for people living with mental and physical disabilities, such as the Ability Center in Abu Dhabi. “People are struggling everywhere, whether it’s at the Ability Center or whether you are playing for regular audiences,” McBride says. Through music, Mary and her band aim to provide a distraction from the struggles that life brings. Despite the vast and diverse cultures of the world, she engages and communicates to her audience using music as a universal language. Since its establishment, The Home Tour has connected with more than one hundred social service organizations globally. Of course, touring and traveling for long periods of time is very draining and full of possible big and small problems. When we met Mary and the band on Thursday morning before boarding the bus and heading off to the Ability Center, there were dozens of boxes, bags, and crates. We couldn’t help thinking what would happen if one went missing? Would it be a disaster, or would they improvise? Despite the casual and calm aura at Ability Center on Thursday morning as the kids waited itchingly in their seats facing the band and their never ending equipment and instruments, there was definitely an air of excitement. We could tell this would be something special. As soon as the band started playing, kids attending the Center with different disabilities and of all ages started to clap, dance, and most memorably, smile. The reactions of the children at the Ability Center were not much different from the reactions of the audience at the concert held at NYUAD on Thursday night. People let loose, danced, and laughed. This without a doubt showed the magic of music and how it brings us all together. Along with meeting Mary McBride, we were also fortunate enough to meet another well-known artist, Noor Al Suwaidi. An Abu Dhabi native, Noor graduated from the American University in Washington, DC, with a bachelor’s degree in Studio Art. She later obtained a master’s degree in Curating Contemporary Design from Kingston University, London. Noor’s artwork has been exhibited in gallery shows in London, Kuwait, Berlin, Washington D.C., Dubai, Sharjah, Al Ain, and Abu Dhabi. Currently, she is represented by Cuadro Gallery in Dubai. As a curator, Noor specializes in curating exhibitions of Emirati artists both locally and internationally including for the UAE Embassy in Washington D.C. and within the UAE for galleries in Sharjah and Dubai. She also works for Sotheby’s in London, ING in Amsterdam, and on art and cultural projects for both Dubai Arts and Culture Authority and TDIC’s Cultural Department. Currently, Noor is a part-time faculty at the College of Art and Creative Enterprises at Zayed University in Abu Dhabi. The most recent show she curated, “Past Forward: Contemporary Art from the Emirates,” is currently touring in the United States. We asked her how it feels to be a curator as well as an artist. “Curating is when you have a concept and you get artwork to say your message,” she told us. Even though we are many in this world, there are aspects of society that bring us together as one. Both Noor and Mary spoke of how the arts are a means of communication between nations, cultures, and religions. Noor shared that her dream exhibit would be combining cultures from all over the world and showing their similarities in one venue. Similarly, Mary said that no matter where they traveled during their tour, they were surprised by what artists and songs people knew and identified with. Both of these cultural diplomats show us how art and music can bring cultures, religions, and the seven billion people on this earth together as one.